Are you a digital crackhead? Do you need to check every ping on your phone? Maybe you’re addicted to emoticons and pop ups? If so, you urgently need a prescription for I’d Be Lost Without It. 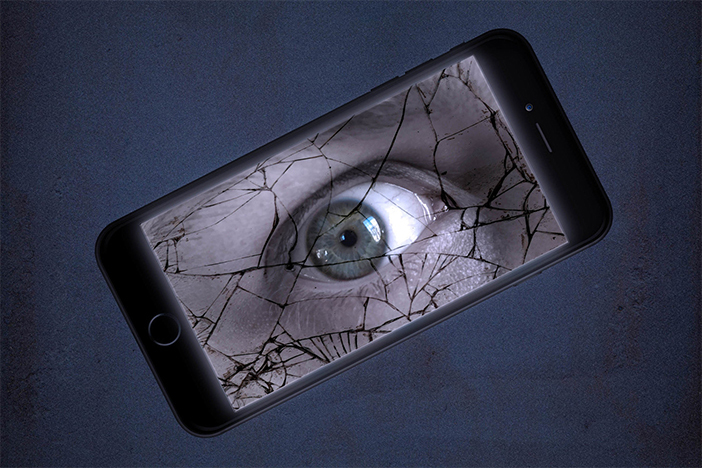 This is top quality immersive theatre from Wet Picnic that hangs up our digital lives for scrutiny. Our five ‘hosts’, with glorious sycophantic smiles, welcome us into the performance space. We put flashing headphones on our ears, we mingle, and some of us are invited into the centre. This is a phone-friendly space we are told. Log on. Reach out to a friend. Look busy. No-one will approach you. Our ‘hosts’ are actors and movement artists who also draw on mime and fooling techniques. They peer at us through rectangular screens. They swipe to the right. They transform into spinning icons or alert balloons and become messages bouncing between users. They animate the software: “your content will resume after this advert”. We are taken through a dystopian tale of fake truth news, lost identities and counterfeit personalities. People can be checking their device over 4,000 times a day. Children’s attention span has reduced by 30%. Empathy between young people is falling. More people in the world have a mobile device than have drinking water. Wet Picnic have done their research, got a psychologist on board, and studied the news. But the performance is asking questions rather than writing a manifesto. So, a woman looks for love but she forgot to change the saturation level on her photo. She gets zero ‘likes’. A young man dies after three solid days in front of the console. But gamesters on each side continue shooting virtual icons. Wet Picnic’s sizzling performance raises tough questions about digital mass hysteria. Press return and see it again.